Click here for all the pix from Day 2. Day 2 is the first full day at convention. It is a long but good one for all. Breaking News! OH Wins 1st Place in Spirit! I reported at 8 am to my judging assignment this year, state scrapbooks. Most states create a traditional scrapbook of pictures with events of the year from the various schools in that state. The book itself is hand-made, and the pages are filled not only with pictures but also with captions and artwork and cool designs. The scrapbook is like 10 normal graphic arts projects rolled into one book. I had never judged scrapbooks before, but luckily for me Rachel Ritchie Kless, the teacher at McAuley, was the Chair of the competition. Rachel knew that I was clueless, so she gave me the easiest task, which was scoring the cover & binding (the materials, the artwork, the functionality of the book). It took me about 2 and half hours to judge 18 state scrapbooks. I had to give 4 different numerical scores and then offer 3 positive comments & 3 areas of improvement. Most were excellent, and some were really fantastic. 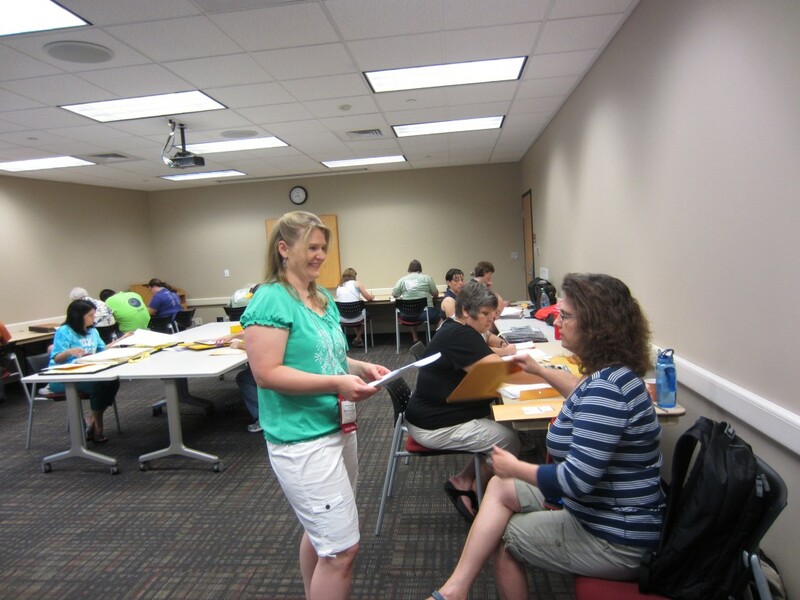 Rachel Ritchie Kless enjoys her omnipotence in the scrapbook sweatshop. 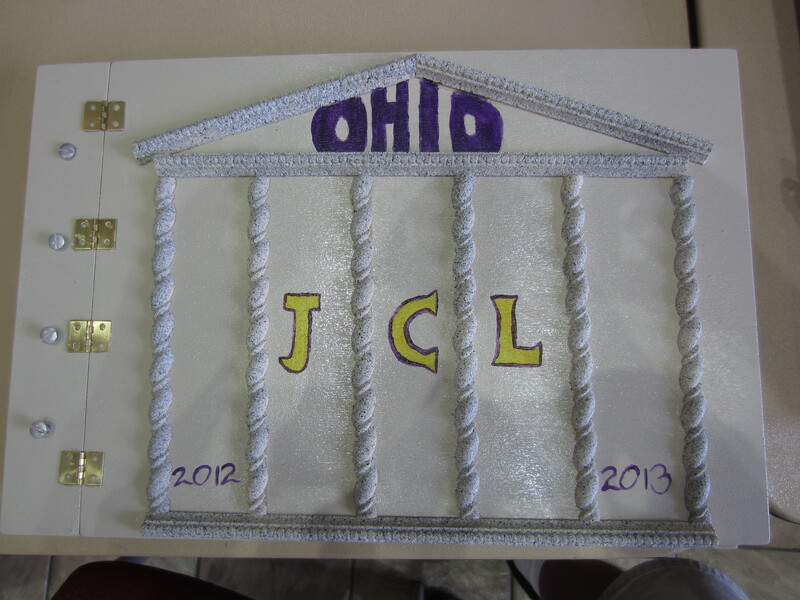 This is the cover of OH’s scrapbook by Historian Becky Steffen. 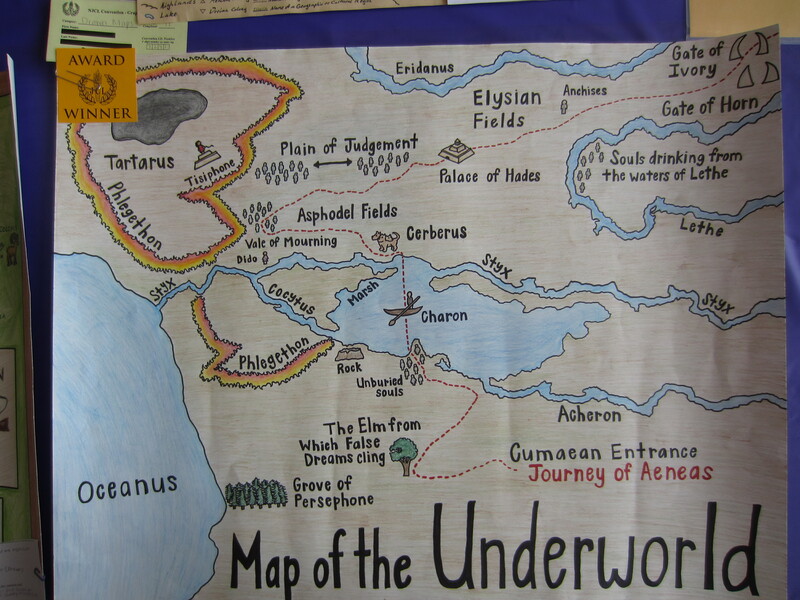 For the students, the morning had 2 main events: open certamen and contest session II. The open certamen is competitive but fun. 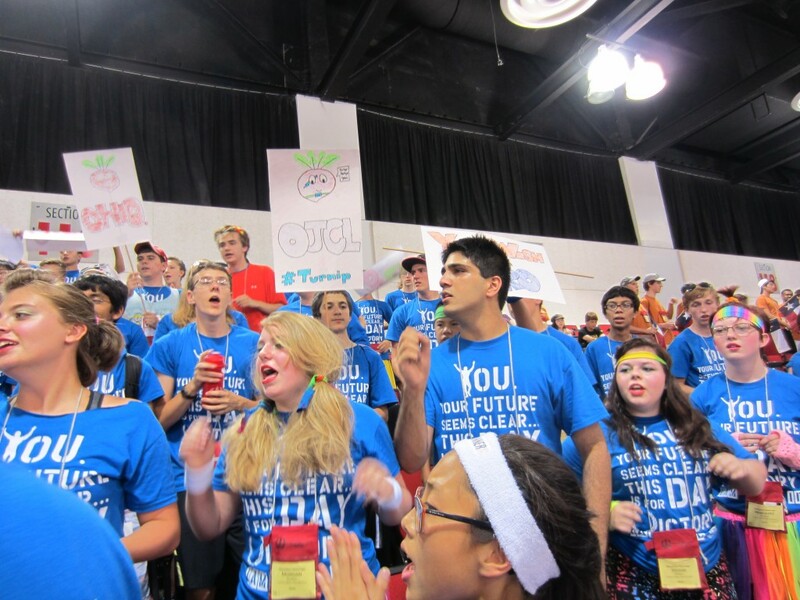 Teams are selected randomly, with students from different states on the same team. 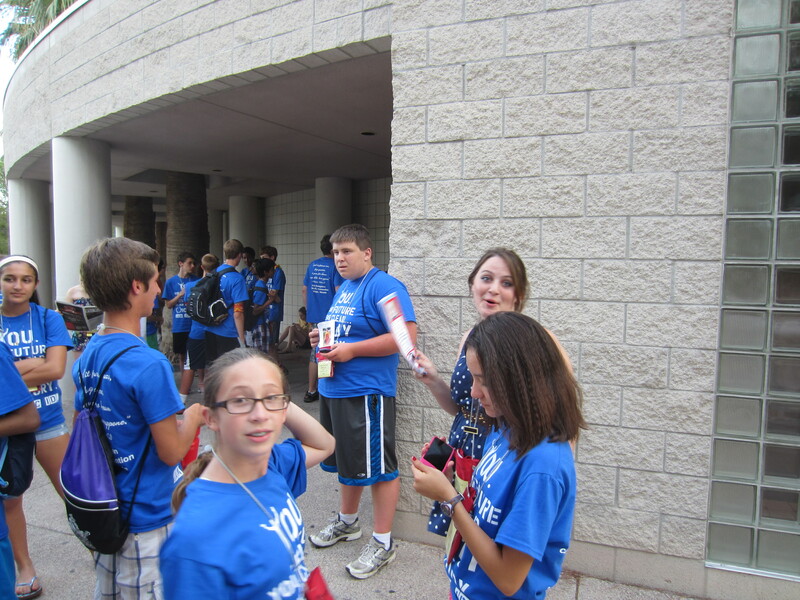 A number of OH students competed, and some I am sure will make the finals later in the week. The tests during the 2 hour session were Reading Comprehension, Roman Life, and Mythology. All OH students are required to attend every test session and take at least 1 test. After judging the scrapbook, I checked out some of the other projects in the 2-D room. There were fewer projects overall this year because almost everyone had to fly into the convention. Check out some of the top 2-D projects among today’s pictures. I was then off to a meeting + lunch for the State Chairs. OH has 3 State Chairs. 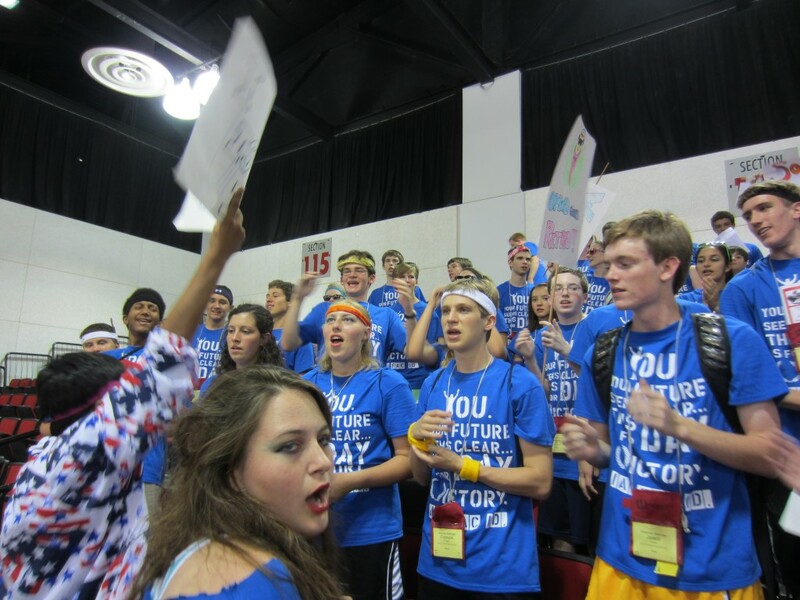 I am Chair of Students, and my main task is to supervise the 12 state officers, so I get to know students from all over the state from all different schools. Emelie Inderhees, teacher at The Wellington School, is the Contest Chair, and she is in charge of the judging and awards for all the different competitions at the state convention. Emelie and I were both at the State Chair gathering. Bryan Inderhees, the (brand new!) husband of Emelie, is the Convention Chair, and he takes care of the myriad of details involved in the state convention in March. Bryan was unable to attend this year. At the meeting, I saw Hugh Himwich, who taught Latin at Summit before me. He now serves as State Chair of New Mexico. I also saw Adam Williams, who is an alumnus of Fenwick, my summer Latin program, and OSU and now teaches at Flint Hill in VA, Hugh’s old school before Summit. It’s a small world after all. 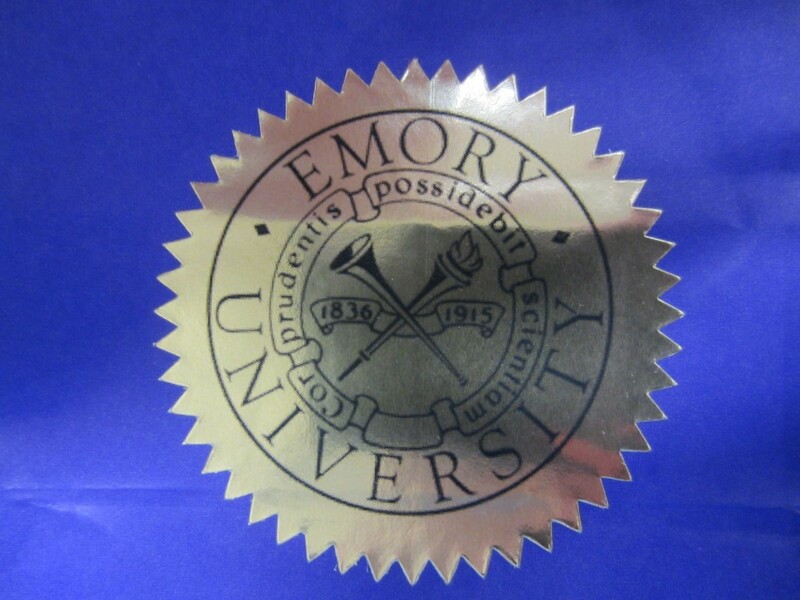 Seal of Emory University: The Heart of a Wise Person Will Seek Knowledge. 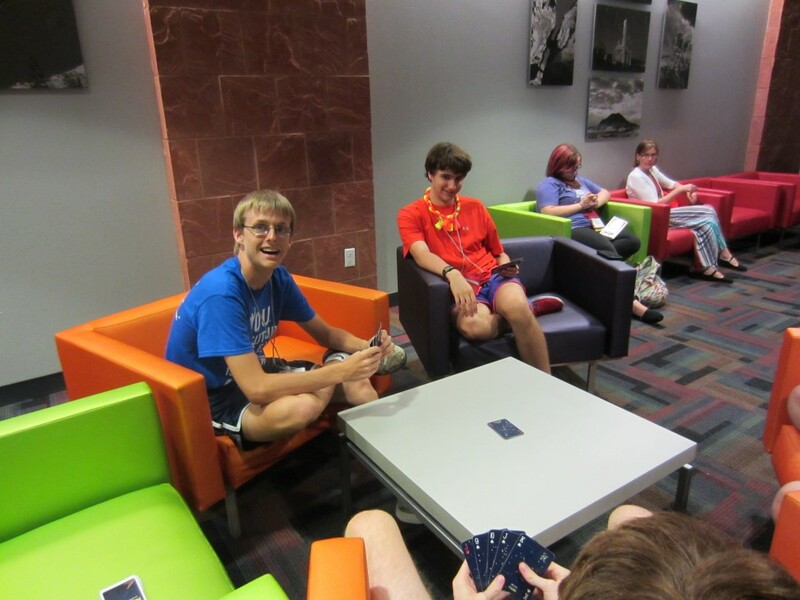 Matt and Nathan play cards in the evening. OH won 1st in Spirit for Large States! Treasurer Narayan Sundararajan was very pleased. He eagerly went to the stage to collect the big prize, a pink slinky. Oooooh, Aaaaaah. Laura Long, the person in charge of student conduct, reminded the girls about the dress code, the length of their shorts in particular. Some were turned away from last night’s dance because their shorts did not meet the dress code as stated in the convention booklet. 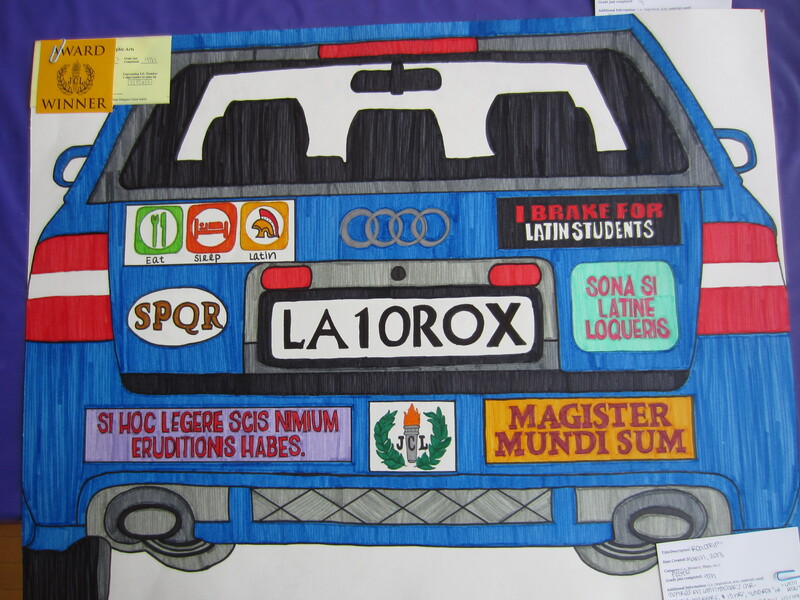 A number of OH students were honored for their scores on the National Latin Exam. 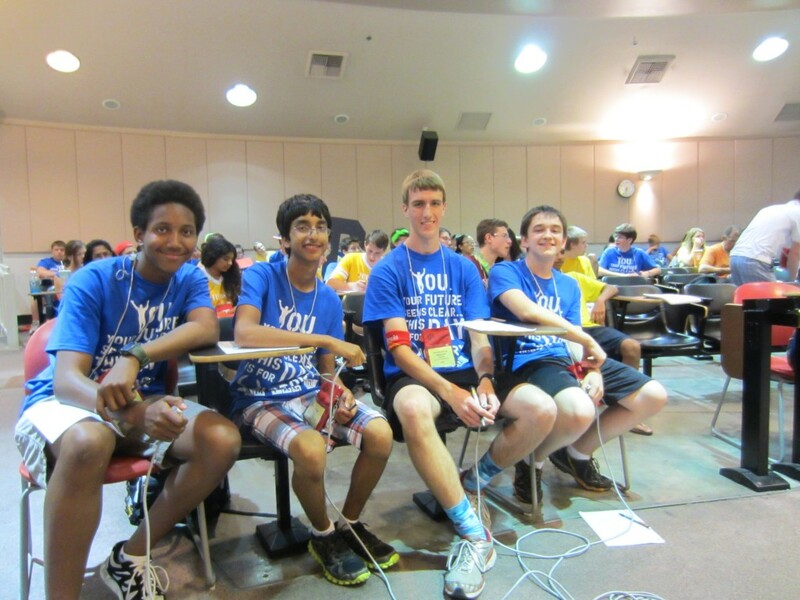 The first of 3 preliminary rounds of certamen took place after dinner. The Upper team had a great round, with all 4 players getting toss-up questions. They earned 215 pts against WI and NJ. The Intermediate team played a bit tentative but still came away with 40 pts against FL and IL. And the Novice team had a tough opening round against potential champions CA and IL. Tullus was quick on the 1st history question to get OH on the board with 15 pts. Rounds 2 & 3 are tomorrow, Semis are Thurs, and Finals are Fri. 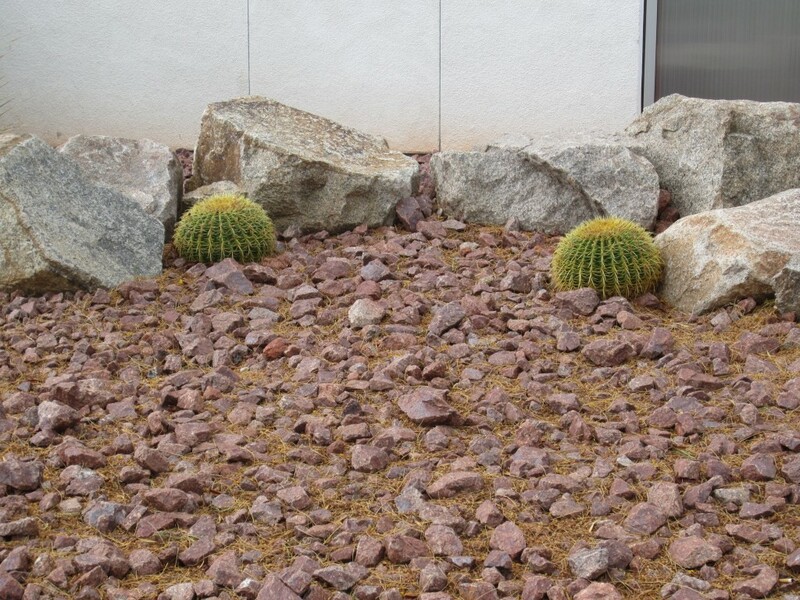 Yes, Las Vegas is in the desert. Waiting for the next certamen match to start.